There are many different shrimps available in the market, with most of them being perfectly suitable for a lightly loaded saltwater tank. In fact, some shrimps are more suitable for fish and invertebrate tanks than for a reef tank since they like to eat corals. Some of the more popular shrimps are Cleaner shrimp Lysmata amboinensis, Blood shrimp Lysmata debelius, Candy cane or Peppermint shrimp Periclimenes brevcarpalis, and Coral Banded shrimp Stenopus hispidus. The cleaner shrimp is denoted by a white on red stripe down the middle of its back. They are fairly inexpensive and easy to keep. They should, however, be kept in small groups (34), as this makes them more social and more likely to come out often. The Blood shrimp is intensely red with some white spots. It is a very striking animal, but usually commands a high price. The Coral Banded shrimp is very popular with reef keepers, but must be watched around small fish. This shrimp has been known to eat small fish without thinking twice. There are many different type of crabs, but the most commonly seen varieties are anemone crabs Neopetrolisthes ohshimia, arrow crabs Stenorhynchus seticornis, and hermit crabs Dardanus megistos. Anemone crabs live in anemones, as do clownfish (e.g., Sebae), and vary greatly in color and shape. They are usually acquired indirectly by buying an anemone, but are some times sold separately. These crabs should have a host anemone to feel comfortable. Arrow crabs are very interesting animals which should be kept one to a tank, as they will continually fight. Also, Arrow crabs should not be kept with Coral Banded Shrimps as they will fight as well. 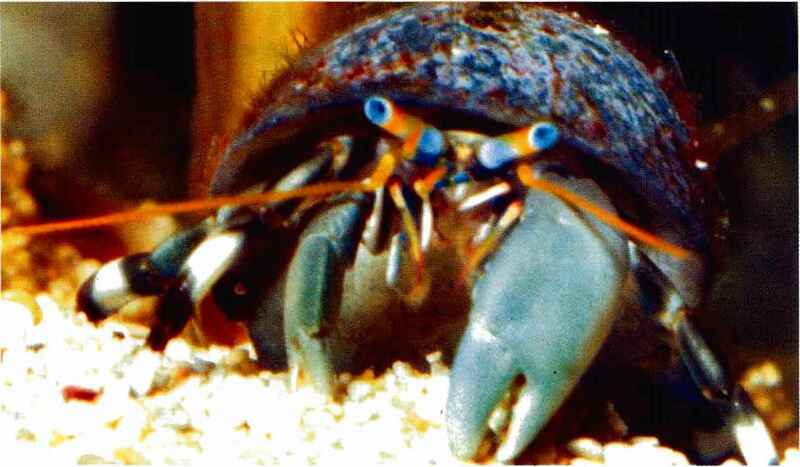 Hermit crabs are also interesting, and vary in color and size. Most are passive, but some will eat corals and other invertebrates. Simply put, anemones should not be kept by beginners (sorry folks). They all require very strong lighting and excellent water conditions. Do not believe a fish store guy that tells you otherwise. Unless you are willing to invest a lot of money in proper lighting, do not try to keep an anemone. Invertebrates are very sensitive to water quality. Signs of stress due to poor water quality will usually be exhibited first by invertebrates. Therefore, shrimps, anemones and other invertebrates should never be used to cycle a tank. Moreover, you should never add an invertebrate to a diseased tank or a tank which does not have stable water quality factors (e.g., pH, temperature, etc. ).